It is as just as important to maintain a good oral hygiene regimen throughout the length of your treatment as it was before. 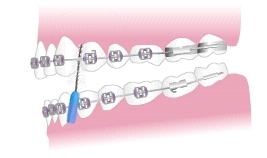 Braces, wires, bands and retainers can all trap food particles and make it difficult to brush or floss away plaque. Careful brushing and flossing, preferably after every meal and snack, is the best way to prevent the build-up, tooth decay and gum disease. Step 1 Start with the outside of the teeth, with the brush at a straight angle. Use circular, vibrating motions. Step 2. 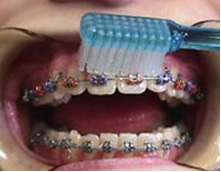 Clean the area between the gums and braces by angling the brush down (up for the lower jaw). Keep moving in a small circular motion. Step 3. Clean the rest of the outside of the teeth by angling the brush up(down for the lower. Step 4. Careful brush the chewing surface of both upper and lower jaw. Step 5. Finishing by brushing inside of the teeth. Step 1. Floss at least once a day. The floss needs to be pull under the archwire. A floss threader facilitate this. Start pulling floss thought the threader. Step 2. Push the end of the floss threader under the archwire and pull the floss through. Step 3. Pull the floss up between the teeth and gently move up and down side of the both teeth. Remember to move it up all the way under the gum. When you are finished brushing and flossing. Rinse your mouth carefully with water or an antiseptic dental rinse. An antiseptic dental rinse can help minor gum inflammations and irritations from the orthodontic appliances. Also usedto cleanse the canker sores, minor wounds and other mouth and gum irritations, this rinse moves debris , enable natural healing to occur. An interdental toothbrush is another aid you might find it useful in keeping tour teeth, braces and gums clean and healthy. 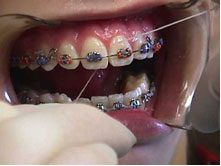 It can be clean under orthodontic wires and around braces. Use this device slowly and carefully, so you do not damage your braces. During the retention phase, it is important to brush your retainer every time you brush your teeth as they can accumulate food particles and plaque. Your teeth may be a little sore for the first week in braces, so we recommend sticking to the soft food diet until the discomfort subsides. While in braces, you can still eat just about anything although there are a few exceptions. You should avoid hard foods, such as ice and pizza crest, as well as sticky foods, including licorice and caramels. These foods can damage wires and brackets. It is also important to minimize foods highly in sugar content, like ice cream and cookies, and reduce sugary drinks to once a day.